MORE quinoa? Yep, I’m afraid so. It’s January, the time for austerity, of body as well as mind. And there’s nothing more crushingly austere than a super-douper health food grain. Right? Wrong. Quinoa, despite its, holier-than-thou goodie two shoes reputation, is actually pretty tasty. Delicious even. I know! I was as surprised as you. Nutty, just the merest hint of crunch, and it stands up to sauces. So good, in fact, that I had to have it twice. In quick succession. Quinoa falls into that category of food, like rice, that goes well with pretty much everything. Last time round it was a creamy, healthy baby-leaves affair. This time, I’ve kept the spinach, but adding a bit more Latin oomph. Gone are the mellow and aromatic spices, now there’s sweet-sharp tomatoes, proper grown up spinach and some punchy, smoky, hot flavours to lift it into the realms of supreme(ly easy) winter comfort food. And yes, it’s still healthy. What else could you do with this wonder grain? I’ve made porridge with it (slightly odd, but it grows on you) and have heard tell of some people playing with Sichuan peppercorns and other nuclear flavours. So much to try! As intimated above, you can have all sorts of fun with quinoa. It’s a blank – but tasty – canvas on which to paint your culinary art. It doesn’t matter whether you’re a Vermeer, Pollock or Ai Weiwei in the kitchen. When it comes to food, quinoa is very forgiving. Boil some water in a small pan, add a little salt and when bubbling merrily, pour in the quinoa. Cook for 13 minutes, then drain. In the meantime, fry the onions until soft, about fifteen minutes on a medium low heat, add the garlic, store a couple of times and sprinkle in the spice. 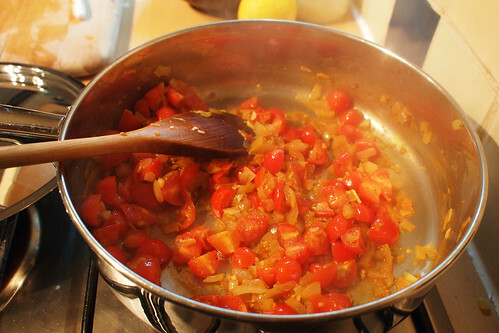 Stir them in, then add the tomatoes. Stir and cook for about ten minutes, then add the spinach. Stir and cook until the spinach is wilted. Now chuck in the quinoa, season with salt and pepper and cook for a couple of minutes more and serve. i like quinoa – you tried amaranth? Similar-ish. Any suggestions for something non-capsicum based that would have the general effect of the paprika? Sounds like it’s a pretty vital part. Sounds delicious. As you have recommended this grain before, I shall have to try it – just need to remember when I do the shop and grab type of meal or the planned one. 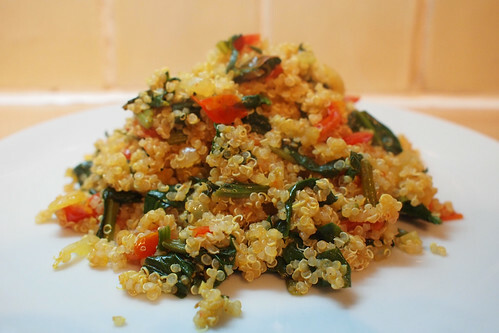 @meemalee – i haven’t tried amaranth, sounds interesting, I’ll try and pick up some when the quinoa runs out. As for the knife and fork motif, it may make a return, or something else may arrive in its place. This is very much stage one of a (hopefully) evolving design. @Lucy – You could add something else that has been smoked, maybe some spanish ham, smoky bacon or possibly smoked fish. That would give you that smooth smokey flavour. Then just leave out the cayenne. @Kathryn – it is! I would highly recommend it as it goes with pretty much anything, and is really very tasty.